1 "Ow!" said Ollie. His toes hurt. He sat down on a rock. He untied long laces from around his legs. Small silk shoes slipped off his feet. 2 The shoes had been shiny white. Now they were dirty and torn. Ollie stretched his stubby round toes. Oooooh! His feet felt so much better! Maybe my friends were right, Ollie thought. 3 When he'd told them he was going to be a dancer, Ollie's friends had shaken their heads. Brachy choked on a bite of leaves. Dippy's eyes had opened wide in surprise. "Why do you want to do that?" he'd asked. 4 Ollie had watched dancers soar and spin. They leaped and bounded, landing lightly on their toes. Ollie thought, How wonderful that must feel! He dreamed of the day his legs would lift him in graceful arcs above the ground. 5 "It'll be great!" Ollie had told them. "I'm not tall like you. 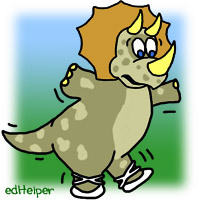 I'm short, even for a Triceratops. I can't eat the tender leaves that grow up high. I can't see over the tops of trees. I'm tired of being so close to the ground. When I'm a dancer, I'll be able to jump and fly!" 6 Dippy's face had wrinkled into a frown. He bent his long neck. His face peered into Ollie's. "Being tall isn't everything," he said. "You can do lots of things I can't do. You have horns." 7 "Yeah," Brachy said. His words were a little muffled. His mouth was full of half-chewed leaves. "Besides," he mumbled, "you have that cool ruffle on your head." 8 "It's not a ruffle!" Ollie stamped his foot. "It's a frill!" Ollie was embarrassed by the sheet of bone that stuck stiffly up above his head. Having it called a ruffle made it worse.